Virgin Australia unveils brand new campaign to illustrate the spirit of the airline and its people with play on words, 'Uptimism', which made its grand debut during the AFL Grand Final. Virgin is the Official Airline partner of the AFL, and the brand most certainly capitalised on this partnership for the launch of their newest campaign during The Grand Final, to reach the large viewership nationally. The AFL Grand Final is one of the most popular sporting spectacles marked in the Australian calendar, reaching 2.801 million metro viewers and 3.694 million nationwide. The campaign 'Here's to looking up' is the first Virgin campaign created by DDB Sydney which focuses on 'Uptimism', where the brand introduces new messaging, new tagline and creative work to reposition themselves. The campaign demonstrates the high spirit of the airline and connects with its passengers that share its values. The TVC was shot across Australia featuring people that share the concept of 'optimisim', including rock climber Andrea Hah from Ninja Warriors, 13-year old rising AFL star Jack Peris and GWS Giants player Adam Kennedy. 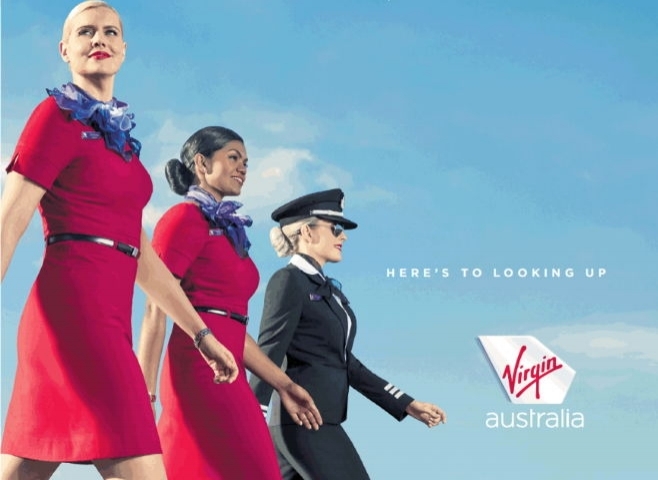 This is the first big campaign launch for Inese Kingsmill who joined Virgin as CMO in January and tells AdNews Virgin has been quiet for a while, because it was gearing up for a major rethink about how it positions itself in the market. One of the things that was important to us, is that ‘We’re the Uptimists’ is the ‘collective we’. It’s our people and the guests who fly with us, who take a positive and optimistic view and share the belief that if we’re positive, then better things happen. In support of the campaign, the Virgin Australia Fan Report was also launched at the Toyota AFL Grand Final, in an Australian-first, which gathered live data on fan behaviour showing how it impacts a teams success. BigDatr has discovered the campaign across Television, Print and is expected to also roll out across digital, social and radio. To view how many people have seen this ad during the AFL Grand Final, log in to access BigDatr's Ad Performance tracking tool.